It’s usually around this time of year that I tend to sit down and have a conversation about wellbeing with you (and myself really). If it’s not about fitness, it’s about womens gym wear and I have a few new favourite pieces that I’m currently loving at the moment. 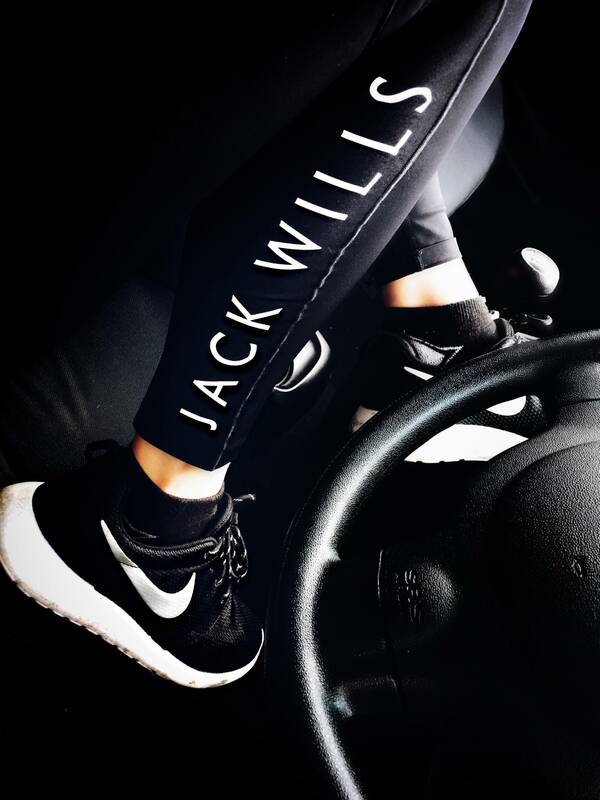 Lots of winter outdoor sportswear saved in my virtual baskets, but happy to be sporting these Elmgate Gym Leggings from Jack Wills. 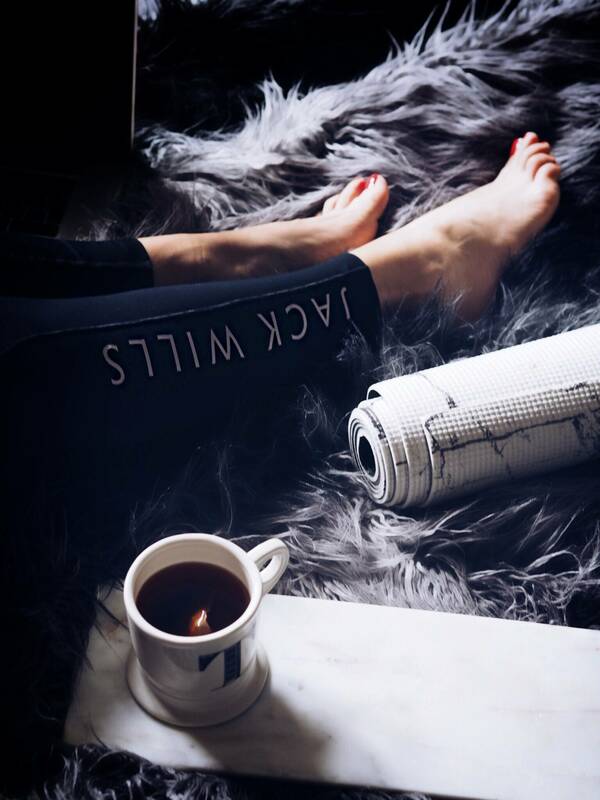 They’re amazing for cardio workouts as they stay in place for the entire workout and are also fab for post-workout “sofa marathons” we all need from time to time. It’s precisely that I want to talk to you about – that balance between work and wellbeing and how taking time to wind down is really necessary. Perhaps you can share what works for you too? I’ve read somewhere recently that last year over 17 million working days in UK were lost due to anxiety, stress and depression. This of course doesn’t include those who work from home and most definitely suffer from the same issues. We just have nobody to report to or ask for a day off. 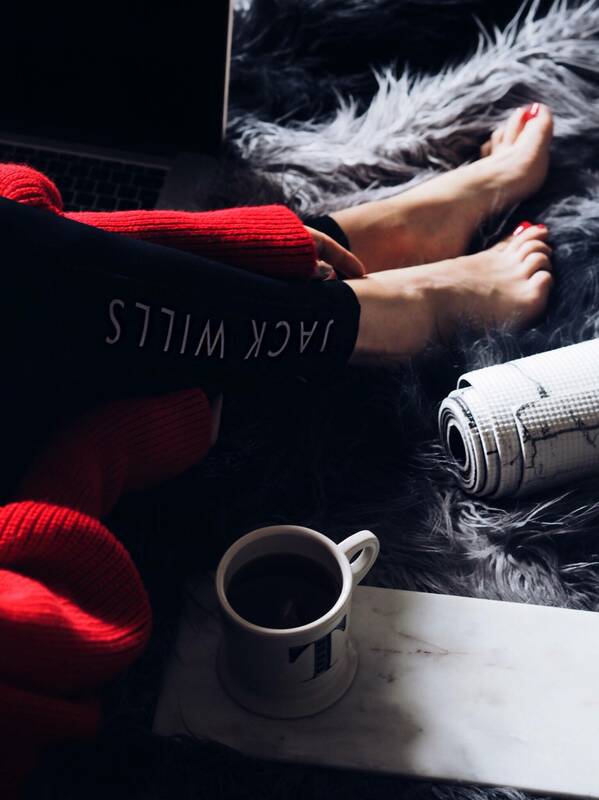 Whilst organisations might try to recreate a more “homely” environment for you to make you feel more at home with big rugs, warm lighting and other cosy elements, what sort of environment should we get inspiration from if we already work at home? We are already cosy. Some even with a separate office room dedicated for one purpose only – work. But here’s the issue and it doesn’t really matter whether you work in an office 9-5 or at home from your “bed office”. We all struggle to fully switch off and it’s technology we have to “thank” for it. I don’t know about you, but if I didn’t sleep at night I’d probably work 24/7 from my phone or laptop. It’s really awful I know but I’m not alone… Mobile technology and the rise of the agile working means we are always switched on. If you’re a business owner and your business uses Social Media or worse, depends on it then you’re already expected to be ahead of the game. Always available, always competing and constantly making sure you’re visible online. It’s our new culture that’s all, especially the industry I’m in. And although digital marketing might not mean that I’m physically exhausted all the time, it takes a big toll on our emotions. All this time on our phones and computers isn’t good for our eyes eyes either but you already knew that. We all know it but can’t help it. It’s our culture. It’s my job. It’s my responsibility. How does one balance their work and wellbeing in this day and age? How do we switch off in this always switched on world? I can’t even meditate or exercise without technology as all of my self-development apps are on my phone. Can’t do yoga as I only remember 3 or 4 salutations without guidance so I do need my laptop for yoga classes at home as well. Here’s what I’ve come to understand my friends. There’s no way fighting with technology and if I’m honest, I wouldn’t want to anyway as my favourite apps have literally transformed the way I live. The real art here is learning to be disciplined with yourself when it comes to switching off. If you can easily switch your phone off for a few hours every night then that’s amazing and I need you to teach me how to do it. But if you’re like me and your livelihood depends on technology and social media and you need a bit of self-discipline, then I have a few tricks and tips that I’ve learnt in the last year or so of my 4 year self-employment. Tried and tested and might help you too. Notifications start bombarding us from the moment we wake up or sometimes they even wake us up. I put my phone on Flight Mode before I go to sleep and only use it as an alarm until I’m ready to use its full “smartness”. Leaving the phone in another room all-together when you sleep might reduce the need to check it first thing in the morning. Creating some quick morning rituals like a short meditation or a stretch might also help set the right energies for the day and help you make more mindful choices. I noticed I even eat better after allowing myself to simply breathe for 5 minutes on my own as soon as I wake up. If you must use your phone for exercising, then try and use apps that don’t need internet or 4G connection and put it on Flight Mode again. I have it zipped up in my pocket for the entire duration of my workouts and don’t try to leave it untouched until I’m home and out of the shower ready for work. One thing we love doing as a family at weekends is going for a long drive to Loch Lomond. As well as being surrounded by beautiful mountains, trees and water whilst breathing purest oxygen, there’s also never any phone signal. Yes, we use our phones to take a couple of pictures and boomerangs, but that’s all. Try to get away somewhere like that every once in a while. It’s so liberating. We all have days when we’re stressed with too much work or days when we need a bit of a push and motivation. It may not be possible to go out for a short walk and we aren’t able escape to the quite mountains. This is when we need to be disciplined enough and command ourselves to take that five to re-centre. When my creativity stops flowing or I just can’t get into the right mindset about things I do two things at home: run myself a bubble bath or pick up a book with a cup of tea for 20 minutes. Or both. And lastly, I wish I could tell you that I fully switch off at night with my phone on Flight Mode and laptop untouched but I’d be lying. It’s one aspect and time of day I still need to discipline myself with and quite frankly struggle with. My blog and Instagram audience is most engaging in the evenings and so that means I must spend time engaging with users at night for a while. But it’s also a nice thing, as I get to talk to so many of you and find so much inspiration from fellow bloggers. One to two hours of work in the evenings and the rest for my family. Huge thanks to JACK WILLS for sponsoring this post. These points are so inspiring, especially the no signal zone. I have such a hard time shutting off phones, apps, ipads & the like too! I definitely love your gym wear and truly appreciate that you’ve addressed this topic. It can be so hard to stay focused and disconnect but also crucial to my life. I am totally off line while teaching ( except for the educational programs my students utilize) and also at home I have limit my technology so I am there for and set a good example for my kids. My husband and I both have all devices off in the evening and we schedule the time we need to be online as a job. I used to spend too much time online and now I’m much more particular about what I look at, read , and spend time on both online and offline. I always make time for quality blogs like yours. I love this gym wear I think I would wear it 247! But like you, I have a hard time switching off.. I work on my laptop at work all day, then I come home and am either on my phone or computer. It’s so bad so I try to switch off my electronics and my mind every night at a certain time and on the weekends if I don’t have to plan a post. But I try not to stay on my phone all day, you’ll get lost in it and that’s never good ! I would need to do as Jennifer and actually set times for when I work (like 9-5 people do) and when I have time off, but being self employed just like you, my boundaries tend to get somewhat screwed up and like two nights ago I couldn’t sleep, so I decided I’d work all night instead, which resulted in me not sleeping for 48 hours and we all know that’s neither good for your body or your mind. I am truly dependant if not even addicted to these freaking gadgets and thankfully I had a week in Greece where I totally left my phone in my hotel room, didn’t bring my laptop with me and funnily enough, I didn’t even have withdrawal syndromes at all. Goes to show I can leave it all behind for a while and the world doesn’t end there, but it’s easier said than done. Thank you for reminding me of the importance of doing so however! It gave me something to think about. Soooo glad you had a break and so glad you didn’t get withdrawals from not using social media so much. It’s insane how addictive it is right? These leggings are sooo nice. I love wearing active wear, and this is definitely something I would like to buy for myself. And the photos you took are gorgeous! Aw I’m so glad you actually went to sleep haha! But also very lovely of you to stop by and read this! Thank you and lets help take care of each other! via social media hahaha…. OMG! I could totally relate to this issues. I am on my phone all day probably 24 hours a day. haha and yes all my workout plans are also on my phone, even my music. I can’t imagine my work out routines without my music tho. This will be hard but I love all tips and guides you mentioned here. I love it! I have to admit I am completely addicted to the work and since my main work is social media … I have to be. I feel completely naked without my phone or laptop. And that is not a good thing…. especially after my burnout a few years ago. I try my best to better myself… but it is hart since I try to be “on” all the time. Love that you are writing about that. I can definitely relate to everything said here! 100% of my work is done on social media and often times I find myself waking up early to work late into the night and my eyes are usually crying for sleep! I need to learn to switch off sometimes and just enjoy time with my family. It’s constantly a work in progress! 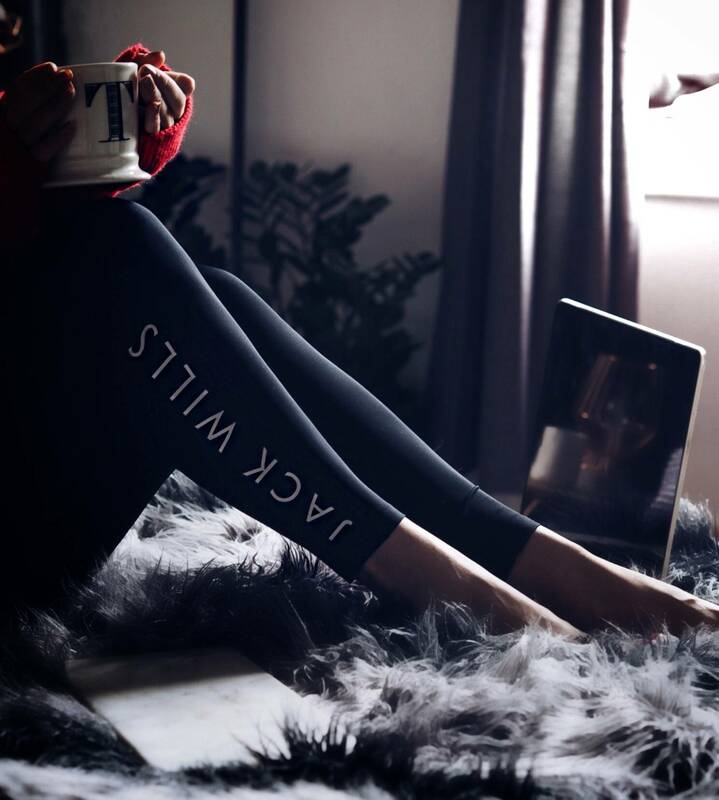 Those tights look amazing and comfy! I’m a fan! Thank you for all of these tips! I barely find time for myself so I’ll definitely be taking these into consideration! Your post really struck a chord with me. Nowadays, my boyfriend and I have been pretty busy and stuck to our phones – i’s difficult to look away sometimes, and I’m back to my bad habit of using my phone before bedtime and immediately when I wake up (even when my eyes are still blurry!) I seriously need to take a step back and try to incorporate some tips from your blog. Thank you so much for sharing them, I feel horrible – yet hopeful that I could at least get us to switch it off tonight – Friday – when we go for a walk in the park! Hello dear, Oh how I love this post. As someone who always has social media on and at the forefront, I needed to read this. Honestly working out is the only thing keeping me sane right now, lol. I would turn my phone off in the evening but my other half lives in Paris, i’m in California and I gotta make sure my phone is nearby so I don’t miss a call or text. But once we finally get on the same time zone, bon voyage to my phone in the evening. I’m always having to deal with my phone especially with my business with p, and my own career. So thank you for this. I can’t wait to one day put my phone on airplane mode… just 3 and a half more months until i’m with my love and that airplane more is ON! It is so important to take time to disconnect, not something I do often enough. But trying to do better about scheduling time off. Also loving this gym gear!